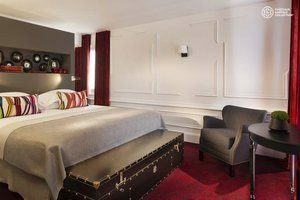 The Hotel Molière is a charming 4* hotel ideally located in the historic centre of Paris. 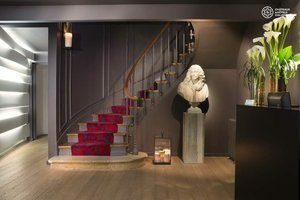 The hotel is a stunning building dating back from 1840, it was built on the site of the former house of King Louis XIV’s surgeon. With its Spa and Wellness Centre as well as its individually decorated rooms, the hotel is a true haven of peace. 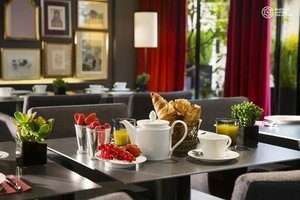 The 4* Hotel Molière is perfectly located at the centre of Paris, in the prestigious 1st arrondissement (district). 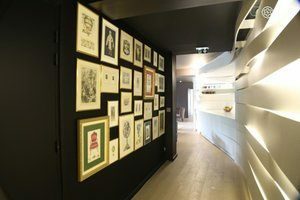 The charming river Seine, the iconic Place Vendôme, the world famous Louvre Museum as well as the Jardin des Tuileries and the Opéra Garnier can all be reached within a few minutes’ walk. The hotel also gives you access to a wide range of cafés, bars, and restaurants. The hotel boasts a lovely Spa and wellness centre including a sauna, a steam room and a fitness room. Massages and beauty treatments are available on request. The friendly staff of the hotel is available 24/7 to answer all of your requests. A delicious buffet breakfast is served every day in a lovely room overlooking the courtyard. Each room is decorated in an elegant and modern style and has en-suite bathroom with a hairdryer, bathrobes and slippers. The comfortable rooms have individual climate control, complimentary WI-FI, a Satellite TV, a minibar and a safe as well as a courtesy tray with a kettle and expresso machine. You will be given free access to the fitness centre, Hamman and sauna.